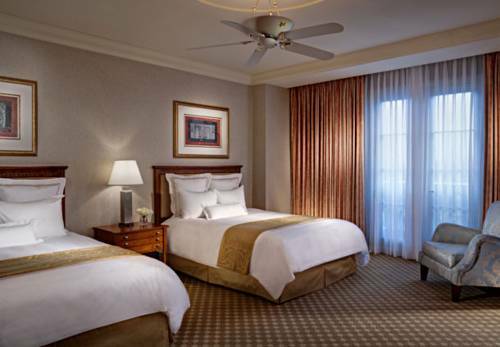 JW Marriott Las Vegas Resort & Spa invites you to discover luxury and comfort here in Nevada. Situated in the stylish Summerlin area of the city, our hotel features immaculately redesigned rooms and suites with pillowtop bedding, marble bathrooms, high-speed Wi-Fi and walk-in closets. Sample fresh Italian cuisine, juicy steaks, healthy options and more at one of our several restaurants, or dine in your hotel room 24 hours a day. Additional resort amenities include the championship TPC Las Vegas golf course, a luxury on-site spa and a sparkling waterfall pool. Spend time at Rampart Casino while you're with us, too. If you're hosting a meeting or event in Nevada, you'll appreciate our expansive venues and delicious catering. In addition to being a short distance from the excitement of the Strip via a complimentary shuttle, our hotel also provides close proximity to attractions including Tivoli Village, Downtown Summerlin and Red Rock National Park. Plan your getaway today at JW Marriott Las Vegas Resort & Spa. Hawthorn Grill: Set in the hotel's Spa Tower, Hawthorn Grill is the perfect place to begin or end your day near Downtown Summerlin. This welcoming hotel restaurant specializes in flavorful American fare, and features a cozy dining room with views of the waterfall. Starbucks : Stop by the hotel Starbucks for your favorite coffee drink while in Las Vegas. In addition to espresso, drip and tea offerings, this lively cafe serves fresh pastries and a selection of handmade sandwiches. Spiedini Ristorante: Enjoy a taste of the Old Country right in Summerlin at Spiedini Ristorante. This Italian restaurant showcases regional classics made from seasonal ingredients. Pair your meal with a glass of wine from our list, and dine outside when the weather permits. Shizen Japanese Restaurant: Feast on fresh sushi and sashimi, as well as the highest-quality steak, at this sleek Japanese restaurant. Tables with teppanyaki-prepared cuisine are available, so you can enjoy watching your meal being prepared in front of you. Waterside Grille: Soak up the Las Vegas sun and savor healthy cuisine at Waterslide Grille, which offers a menu of light fare and creative cocktails. Rampart Buffet: Located within the hotel's Rampart Casino, this plentiful buffet boasts everything from Italian to American dishes. Join us for lunch or dinner daily, and be sure to experience one of our famed specialty dinners and Sunday brunches. Promenade Cafe: Situated adjacent to the Rampart Casino, this international restaurant offers something to satisfy every appetite. Inquire about our Early Riser restaurant discounts. Clubhouse Deli: Clubhouse Deli is your stop for a quick satisfying bite. Our Las Vegas Deli serves hot and cold sub sandwiches, burgers and hotdogs, artisan salads, breakfast sandwiches, bagels with cream cheese, and chili, soups and appetizers.